This is the introductory post for my 6-part post series on the process of knitting a sweater. Scroll down to the end of the post to find links to all of the individual posts. Because fall is quickly approaching – and with it, sweater knitting season – I’ve been doing a bit of thought behind the scenes here at Knitting to Stay Sane (me and my yarn stash are all very excited about it) and prepping a series of a few blog posts on the subject of sweater knitting. One post a week here for the next few weeks will be about a different aspect of the process: a sort of road map to the kinds of decisions that will help you get a sweater that you like. It won’t be an absolutely fully detailed explanation of every technique or step involved – a lot of people have written or published about different aspects of this, and I’ll be pointing you in the direction of many of them – but rather, is intended to be a bit of encouragement if you are a knitter interested in sweaters or figuring out how to approach them with some thought. I often hear from knitters about the whole Sweater Knitting Thing. Among all the many possible choices of garments or items for knitters to construct, many people point to sweaters as being among the most challenging and intimidating. I think much of this is due to their sheer size. Compared to the ball or two of yarn that is normally required for a hat or pair of mittens, or maybe twice that for a scarf, it’s true that sweaters are a commitment of both yardage and time – and let’s face it, some days you don’t have much of either. But I don’t think that project size is always the true litmus test of challenge. Hold up a scarf worked in the Orenburg style of lace in one hand, and a stockinette pullover in the other, and then ask yourself if sweaters are always going to be more challenging than scarves. It’s true that larger projects do ask a commitment of you, but “challenging” or “easy” is often in the eye of the beholder. However, I do agree that sweaters offer the knitter a sufficient – and often satisfying – amount of challenge, even putting aside the whole notion of size. Sometimes it is because we fixate on a particular technique that is used in the pattern (“Oh, that’s a beautiful cabled pullover, but I’ve never done cables before and I’m worried it’ll be too hard”), but it’s a rare technique that is applicable only to one kind of garment. Much of the real challenge with sweaters has to do with the fact that sweaters are garments that are going to be worn over a large portion of our bodies, and therefore need to fit us according to the many dimensions of those parts. The fact is that even if you choose a pattern which is a loose-fitting stockinette box (thus avoiding fabric-construction techniques which might be daunting), you still have to ask yourself how long you want it to be so as not to overwhelm your body, and how long the sleeves should be so as to not end up constantly tugging them down or rolling them up, and what colour it should be, and what yarn you should use, and so on. The challenge comes from the fact that we need to be in control of our relationship with the garment we are knitting, much, much more so than with other kinds of knitted objects. If you’re a person who is already familiar with other methods of garment construction – for example, if you’re a sewist who also knits – you’ve had other opportunities to ask yourself some of these kinds of clothing-making questions. Still, knitting offers us the chance to ask different questions than other crafts. Not only are we constructing a garment, but we are constructing the very fabric that the garment is going to be made of. This fact results in a lot of agonizing over things like gauge, swatches, yarn substitution, fiber content, yardage, and so on. Put these together with the project of making a large garment, and, well. There is a lot going on with sweaters. For many of us, we are used to acquiring clothes by going to a store (or many stores), trying on clothes (possibly many many clothes), and buying the ones that fit and leaving the store with those specific items. Sometimes our knitterly approach to making sweaters mimics this – we choose the sweater size we think will fit, then knit it, then try it on and see if it fits. While this is certainly a way to get sweaters, it overlooks a lot of steps that are open to us as knitters to help us get the sweater we really like and will actually wear. When you knit a sweater, you have many possible decisions open to you, relating to pattern and yarn selection, fit, techniques, and so forth. Rather than viewing this as a series of little intimidations, I think it’s best to consider these as opportunities for you to be in charge and get the results that you want. You are the boss of your knitting, and even if you make mistakes they are your mistakes, not the mistakes that were made for you by some clothing manufacturer. YOU get to decide what results from the work of your needles. 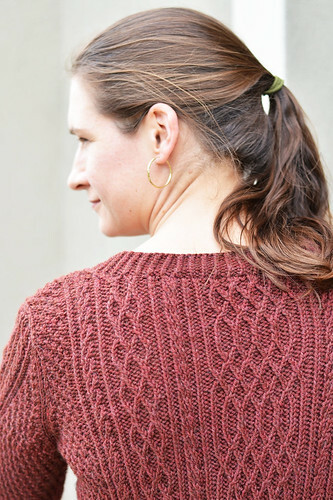 If you are a knitter new to sweater knitting, or simply a knitter happy to learn more about the whole process of working a completed, satisfying sweater, this blog post series will definitely be you. Over the next few weeks I’ll be writing about the process of constructing a knitted sweater, from pattern selection and construction styles, to gauge, yarn selection, and finishing. I don’t intend this to be a comprehensive guide to all things involved in sweater knitting; I won’t, for example, be giving you step-by-step breakdowns of how or where to add short rows or demonstrating all kinds of increases or decreases – but I’m going to include links to resources along the way for things like that which might be helpful. While this will not be a comprehensive guide to every possible sweater pattern or every possible detail involved, it will help you find your footing in the land of sweater knitting if that is something you are interested in learning more about. I won’t tell you what sweater you should make or how much time you should give yourself to knit it, but I do hope that when you do arrive at making these decisions for yourself, you’ll be armed and ready to do it right. Looking forward to seeing you all next time! I hope you’ve got something fun on the needles, whether big or small. I am very much looking forward to this series! This will be a great help as I would love to knit a sweater but I am intimidated. Thanks. This is just what I need. I am ready to try to knit a sweater!! So timely! I’ve knit my first sweater and am planning on another for my next project once the Holden Shawlette is off the needles. Despite feeling no fear and making many modifications to my first attempt, I still wasn’t completely satisfied with the outcome. I look forward to sharpening my skills for Sweater #2. Also, I look forward to regular Thursday posts–it’s like a little present every week. Thanks so much! I’m really looking forward to this! I’m really excited to read this! Lately, I’ve been feeling like the sweaters that I make are hit and miss, so I want to hear your thoughts on how to pick patterns/mod them to make them fit you and your style. Glenna! This is right on time for me. I’m trying to talk myself into knitting Anything Other Than Neckwear but I need more nudging. I’ve knit a lot of sweaters, but am always ready to learn something new. I look forward to this series. I will be watching this space! And so looking forward to the posts. I’ve knit seven sweaters and I’d like to be more confident during the knitting process that the sweater will fit well. Ooooh, this sounds great! I’ve yet to bite the sweater bullet, mostly because knitting 1500-2000 yards (for larger sizes) sounds crazy, but I desperately want a lovely knit sweater. This sounds like a great series and I look forward to it. I guess for me the challenge in knitting sweaters starts with the really large expense in getting the yarn. I can buy a skein of laceweight for under $30 and knit for six weeks or so and get a lovely shawl and lots of fun knitting. I can’t get yarn for a sweater for much under $75 even with using Cascade 220. Therefore I have a much bigger investment in knitting a seater. I can’t wait for this series – thank you! I made my first sweater about a year ago by choosing a pattern and size, and knitting it. Haven’t worn it once because it just doesn’t fit right. 😦 I see so many handknit sweaters I would love and would buy if they were in a store and I could try them on first, so I really need to learn about how to choose the correct pattern for my body shape and how to modify it to make sure it’s going to fit. Some tips on appropriate yarn would be amazing too! I am anxious to read this series since I have only knitted 4 sweaters. They are not complicated ones yet, but I’m still trying to feel ‘comfy’ doing it. Thanks for writing all about this for us!!! I’m interested to see this series. So far I blindly follow patterns and just hope they fit – it’s a 50/50 chance lately. I’m glad you are doing a series on this. 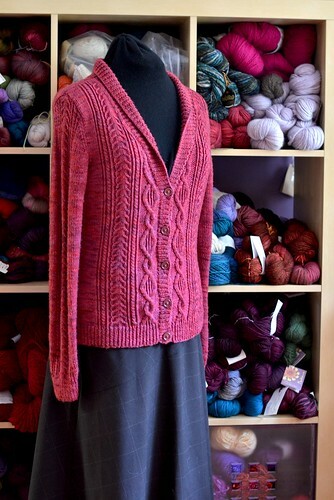 I found a basic cardigan pattern of yours on Ravelry and was a aprehensive about gauge, customization, etc. on my second go at a sweater, or in this case, a cardigan. My first attempt was fine, but I didn’t make a gauge so the entire time I was knitting it (top-down construction) I was REALLY hoping it would fit in the end. It did. =) Looking forward to your posts! I’m excited about your series! I have not yet tackled sweaters but it’s something I want to learn to do. Good luck with the posts! It is so good to read your blog and to glean all the required knowledge to make a good sweater! have been knitting afghans and mufflers and hats, but am filled with trepidation when it comes to starting a sweater! looking forward to reading your series! After knitting several sweaters…each one a little better than the last, but still not quite what I want …your timing is perfect for this series. Looking forward to it! I’m really looking forward to this series! I’ve knit many sweaters (for myself and others), but they are all different and have their own challenges. I always want to read more advice about getting them to come out the way I want. I’ve knit sweaters and of all the ones i knit I only have one that I haven’t frogged.. Yes, I even frogged completed sweaters because I didn’t like how they fit on me. So now I’m very careful of what patterns I choose to do. One the good side I have some nice sweater amounts of yarn. Sounds like fun! And while I already understand a lot of these things I love learning how other people approach stuff. Also I’m sure there’s something you know that I don’t! Thank you so much – as others have mentioned this is perfect timing! I’m a relatively new knitter but the plethora of awesome sweater patterns has me salivating to start one – but, am nervous to leap in because of the exact things you mentioned. Can’t wait for the next post! This is very timely. I restrict my knitting to socks and scarves. Next I am actually stretching myself to knit a cowl. (crazy nut that I am, yes, scarf to cowl, wow, what a leap). Sweaters intimidate me on so many levels, I am not brave enough to try one yet, but I really, really want to. I will enjoy reading your thoughts on this. Home from the computer-free summer at the trailer and getting caught up on blog reading. Looking forward to your series on sweaters and I will see you at Knitfest on Sept 29th.